The Nobel Prize highlights achievements in physics, chemistry, physiology or medicine, literature and for peace. Since its inception, many awards have recognized achievements made in molecular biology, structural biology, and related research. 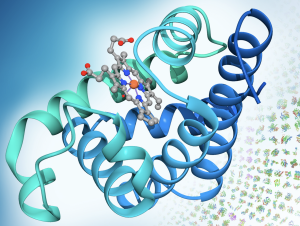 Molecule of the Month articles offer a starting point to explore these Prizes. Myoglobin was the first protein visualized in 3D by X-ray crystallography, laying the foundation for a new era of biological understanding. For this discovery, John Kendrew and Max Perutz shared the 1962 Nobel Prize in Chemistry. "for their discovery of cancer therapy by inhibition of negative immune regulation"
"for their discoveries concerning a novel therapy against infections caused by roundworm parasites"
"for her discoveries concerning a novel therapy against Malaria"
"for their discoveries of machinery regulating vesicle traffic, a major transport system in our cells"
"for their discoveries concerning the activation of innate immunity"
"for his discovery of the dendritic cell and its role in adaptive immunity"
"for his discovery of human papilloma viruses causing cervical cancer"
"for their discovery of human immunodeficiency virus"
"for the discovery and development of the green fluorescent protein, GFP"
"for their discovery of RNA interference - gene silencing by double-stranded RNA"
"for his studies of the molecular basis of eukaryotic transcription"
"for their discovery of the bacterium Helicobacter pylori and its role in gastritis and peptic ulcer disease"
2004 Chemistry Aaron Ciechanover, Avram Hershko and Irwin Rose "for the discovery of ubiquitin-mediated protein degradation"
2003 Chemistry "for discoveries concerning channels in cell membranes"
"for the discovery of water channels"
"for structural and mechanistic studies of ion channels"
"for their discoveries concerning genetic regulation of organ development and programmed cell death'"
"for their discoveries concerning nitric oxide as a signalling molecule in the cardiovascular system"
"for his discovery of Prions - a new biological principle of infection"
"for their elucidation of the enzymatic mechanism underlying the synthesis of adenosine triphosphate (ATP)"
"for the first discovery of an ion-transporting enzyme, Na+, K+ -ATPase"
"for their discoveries concerning the specificity of the cell mediated immune defence"
"for their discovery of G-proteins and the role of these proteins in signal transduction in cells"
"for their discoveries of split genes"
"for their discoveries concerning reversible protein phosphorylation as a biological regulatory mechanism"
"for their discovery of the cellular origin of retroviral oncogenes"
"for their discovery of catalytic properties of RNA"
"for their discoveries of important principles for drug treatment"
"for the determination of the three-dimensional structure of a photosynthetic reaction centre"
"for his discovery of the genetic principle for generation of antibody diversity"
"for theories concerning the specificity in development and control of the immune system and the discovery of the principle for production of monoclonal antibodies"
"for her discovery of mobile genetic elements"
"for his development of crystallographic electron microscopy and his structural elucidation of biologically important nucleic acid-protein complexes"
"for their discoveries concerning genetically determined structures on the cell surface that regulate immunological reactions"
"for his fundamental studies of the biochemistry of nucleic acids, with particular regard to recombinant-DNA"
"for their contributions concerning the determination of base sequences in nucleic acids"
"for the discovery of restriction enzymes and their application to problems of molecular genetics"
"for their discoveries concerning the interaction between tumour viruses and the genetic material of the cell"
"for their discoveries concerning the chemical structure of antibodies"
"for his work on ribonuclease, especially concerning the connection between the amino acid sequence and the biologically active conformation"
"for their contribution to the understanding of the connection between chemical structure and catalytic activity of the active centre of the ribonuclease molecule"
1971 Physiology or Medicine Earl W. Sutherland, Jr.
"for his discoveries concerning the mechanisms of the action of hormones"
"for their interpretation of the genetic code and its function in protein synthesis"
"for their discoveries concerning the primary physiological and chemical visual processes in the eye"
"for their discoveries concerning genetic control of enzyme and virus synthesis"
"for her determinations by X-ray techniques of the structures of important biochemical substances"
"for their discoveries concerning the molecular structure of nucleic acids and its significance for information transfer in living material"
"for their studies of the structures of globular proteins"
"for his research on the carbon dioxide assimilation in plants"
"for their discovery of the mechanisms in the biological synthesis of ribonucleic acid and deoxyribonucleic acid"
"for his work on the structure of proteins, especially that of insulin"
"for his work on nucleotides and nucleotide co-enzymes"
"for his work on biochemically important sulphur compounds, especially for the first synthesis of a polypeptide hormone"
"for their discovery of the ability of poliomyelitis viruses to grow in cultures of various types of tissue"
"for his research into the nature of the chemical bond and its application to the elucidation of the structure of complex substances"
"for his discovery of the citric acid cycle"
"for his discovery of co-enzyme A and its importance for intermediary metabolism"
"for his discovery of streptomycin, the first antibiotic effective against tuberculosis"
"for their discoveries relating to the hormones of the adrenal cortex, their structure and biological effects"
"for their discovery of the course of the catalytic conversion of glycogen"
"for his discovery of the part played by the hormone of the anterior pituitary lobe in the metabolism of sugar"
"for the discovery of penicillin and its curative effect in various infectious diseases"
"for his discovery of human blood groups"
"for the discovery of insulin"
Several awards have recognized the methods and techniques that enable structural biology research. "for the development of multiscale models for complex chemical systems"
2002 Chemistry "for the development of methods for identification and structure analyses of biological macromolecules" with one half jointly to John B. Fenn and Koichi Tanaka "for their development of soft desorption ionisation methods for mass spectrometric analyses of biological macromolecules" and the other half to Kurt Wüthrich "for his development of nuclear magnetic resonance spectroscopy for determining the three-dimensional structure of biological macromolecules in solution"
"for his contributions to the development of the methodology of high resolution nuclear magnetic resonance (NMR) spectroscopy"
Gerd Binnig and Heinrich Rohrer "for their design of the scanning tunneling microscope"
"for their outstanding achievements in the development of direct methods for the determination of crystal structures"
"for his discovery that enzymes can be crystallized"
"for their preparation of enzymes and virus proteins in a pure form"
in recognition of the extraordinary services he has rendered by the discovery of the remarkable rays subsequently named after him"